Updates with new diagrams and links. This best-selling one-stop resource is packed with practical advice on how to tackle the basics, such as simple chords and finger-picking, right through to more complex power chords, slurs, bends and slides. It also includes tips on stagecraft and performing live, and step-by-step guitar maintenance. 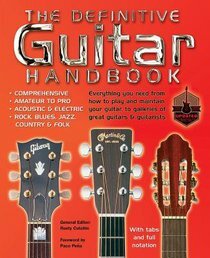 The galleries of guitars and guitarists, the chord dictionary and scales have been comprehensively updated for this edition. About "The Definitive Guitar Handbook"
Rusty Cutchin is a musician, recording engineer, producer and journalist. As a journalist he has been technical editor of Guitar One, associate editor of Electronic Musician and editor-in-chief of Home Recording Magazine. As a recording engineer he has worked on records by artists including Mariah Carey, Richie Sambora and Yoko Ono. He has been a consulting editor and contributor to several Flame Tree books.